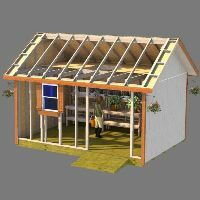 Good and thorough planning before building your shed is the key to a successful shed building project. The following checklist will help you to gather information you will need before starting construction of your new shed. Ok, In my county which is Greene County Ohio, if you get a permit, there is only one inspection and that is the final inspection. Before building can begin, you must submit a drawing of your house plot and exactly where you plan on building your shed in relation to property lines, your home, etc. They obviously have restrictions on where exactly you can place your shed from your property lines. Each county is probably somewhat different, but in Greene County Ohio, you are required to keep your shed 5' off the property line. You certainly want to avoid running into problems later on by not obtaining a building permit for your shed. 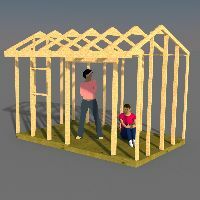 It is possible that if you do build a shed without a permit, your county can fine you or even make you tear it down if you are in violation of building codes. Do You Have Deed Restrictions? You may have conditions on your property deed which restrict the type and location of your shed! Check to make sure you are not going to build your shed on property controlled by an easement for right away or access to utilities. What's the climate going to be around your new shed? Do you need to worry about drainage problems or prevailing wind conditions. What's the angle of the sun in relation to nearby landscaping during different seasons. A shed that is enclosed and does not have temperature regulation should be protected from the summer sun, and exposed to it in the winter. 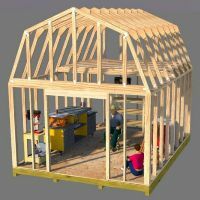 I often get email questions from potential buyers of my shed plans if those particular plans conform so their specific location. It is impossible to do up a plan that will be acceptable to all locations, but they are written to conform to general building codes. 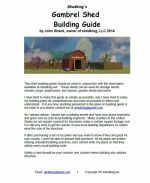 Usually after you submit my shed plans to your local building inspector, they will make notations on your plans about what you need to do to get your structure up to their code regulations. What is the purpose of your new shed? Ok, what do you want to do with your new shed? Will it be a garden shed for your wife, or a shed to store tools in, or your riding mower? Will you need electricity? Will you need shelving or a sturdy shed ramp? How about a workshop or hobby area? Carefull planning on your shed before you begin building will save you from making costly changes in the future. In the grand scheme of things, sheds are not that costly to build. It's a good idea to go over each phase of your shed building project such as reviewing the materials needed for building your shed foundation and floor, walls, doors, roof, siding, etc. Quite a few of your bigger hardware stores will go over your materials lists and give you an itemized estimate of all your materials, including delivery charges. Know what you have to spend and don't be caught by any surprises. You can view and print off the materials sheets for all my sheds that I sell plans for. Once you have found the materials sheet for the shed you are wanting to build, just take it to your favorite lumber supplier, or all the lumber suppliers in your town, and have them look up the items listed for you and get a total materials cost for building your shed.